Don’t be afraid to mix up recipes you already have! This recipe is one my wife and I have tried before. The original recipe calls for fingerling potatoes and escarole. It is also prepared in a different manner. The original recipe calls for simply steaming the fish on top of the greens. Personally, I don’t draw much excitement or flavor from a piece of steamed fish. So we choose to pan sear it and give it a little texture. When you are looking for new recipes, don’t be afraid to modify ones you have already tried before. You can easily get caught up in mundane recipes when dieting. If you look for ways to change things, you will begin to treat this more as a lifestyle change than a diet, and that will make you much more successful. As a side note, I haven’t been able to hit the gym in the last couple of weeks. I went in yesterday morning before work and have yet to take one step without that familiar muscle soreness. A reminder of how easily your body gets used to doing nothing! The best recipe for sore muscles…working out again! I will be in the gym again before work in the morning. Step 1 Rinse and pat dry Tilapia filets. Step 2 Heat coconut oil and garlic in large skillet over medium heat. Step 3 Salt and pepper tilapia filets and pan sear for 2 minutes on each side. Step 4 Remove filets from pan. Step 5 Add kale to pan and cover. Steam for 5 minutes. Step 6 Add Tilapia filets over kale and sprinkle oregano over top. Step 7 Continue to steam for 5 more minutes. Step 8 Meanwhile, whisk lemon juice together with olive oil and season with salt and pepper to taste. Step 9 Remove fish from pan and plate next to kale. 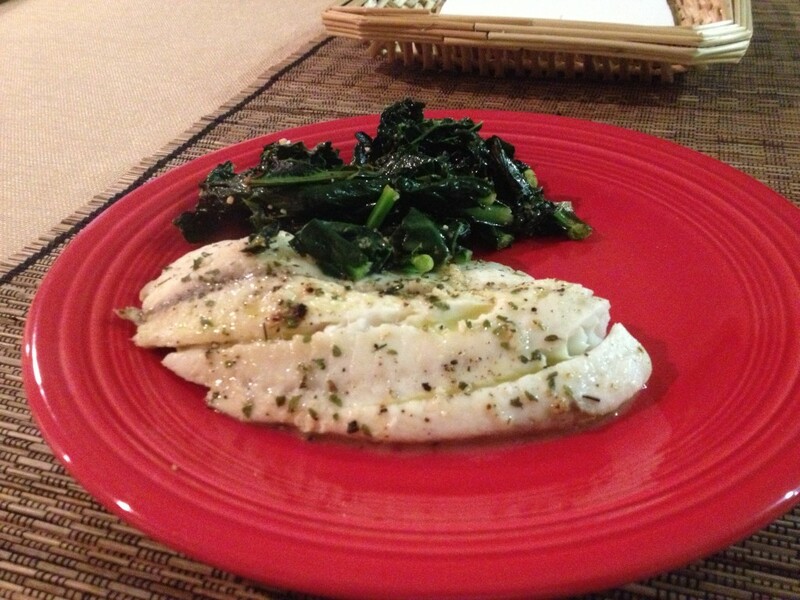 Drizzle lemon-pepper oil over both Tilapia and kale. If the flavor of Kale is too strong for your palette, substitute escarole with has a milder flavor.